You’ve probably spent a lot of time perfecting your WordPress site and creating content for it. And (spoiler alert) after all that work, you want it to be successful. So what happens if your site is the target of a hack, data gets corrupted or accidentally deleted, or your site spontaneously combusts (metaphorically speaking)? Rather than whacking back the flames and shaking a fist at the sky (“Oh, the humanity!”), you’ll want to safeguard your site before trouble strikes with regular backups. A backup is simply a copy of your site, which can be used to restore it in case of emergency. If you always have a recent backup handy, you’ll be able to repair your site without melting down. In this post, we’ll discuss everything you need to know about backups. This includes what they are, why they’re important, and how to actually create them. Plus, our in-house WordPress guru Mika Epstein will weigh in on why backups matter. And trust us: As a 40-time (!!!) WordCamp attendee and core contributor, she knows her stuff. Jetpack is a comprehensive plugin that provides many security options and is included with our DreamPress plans. Your WordPress site relies on a lot of data and files in order to run properly. What’s more, the information it contains only grows as you add more content. This makes it increasingly important to protect this information from anything that could go wrong. Developing a comprehensive security plan for your website is a smart idea. WordPress is inherently secure, but that doesn’t mean it’s infallible. There are a lot of measures you can take to make it even less likely that your site will be compromised. But the fact is, no matter how careful you are, there’s still risk involved in running a website. That’s why performing regular backups should be an integral part of your security plan. A backup is a copy of all your site’s key files and data, which you can store in a safe external location. If there’s a problem with your site you can’t fix, you can use this copy to restore your site to how it was before the issue occurred. Your site could get hacked, and your information could be tampered with or stolen. Files might get accidentally (or intentionally) corrupted or deleted. Something you install, such as a poorly coded plugin or theme, could break existing features. Without a backup to rely on, data loss can be a dire situation. You could permanently lose content or vital information, have difficulty getting your site to run the way it did before, or even see it brought down completely. With a backup, however, you have a quick way to solve these problems. You can copy over your backup and restore the site to its former state — before the hack, compatibility error, or other issue occurred. You can even use a backup to create a testing or staging site if you’d like, which can help you troubleshoot problems safely. But a backup isn’t a silver bullet. For example, it won’t help you get back stolen information (which is why it shouldn’t be the only security measure you take on your WordPress site). However, it’s a vital part of your strategy that shouldn’t be overlooked. Creating backups is one of those tasks that should be performed on every website — no matter its size, focus, or goals. Because backups are table stakes in the website world, there are a lot of simple ways to create them. Most of these techniques rely on tools you can download and use throughout the process. 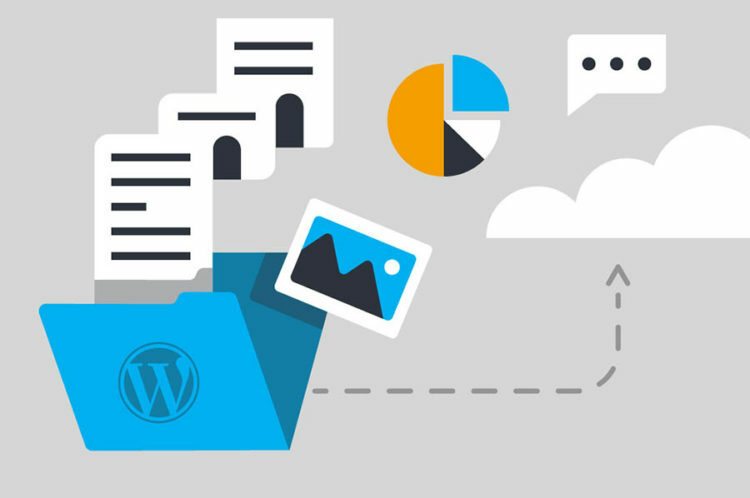 WordPress makes the process of putting together a backup fairly straightforward — and with a quality hosting plan, it’s even easier. Let’s discuss two methods for backing up your website, and talk about when to use each one. First, let’s talk about the easiest way to deal with the need for backups on your site. You can find and implement a solution on your own, and we’ll show you two ways to do so later on. However, if you’ve chosen the right web host, you may be able to get some help with the process. A quality web host can make the task of creating backups easier for you or even save them for you. This provides invaluable peace of mind and takes some of the work off your plate so you can focus on other things. If you have a WordPress hosting plan here at DreamHost, for example, you’ll get access to some handy backup-related features. No matter what kind of plan you get, you can use a one-click backup option through your account to save your website’s database, as well as your users and mailboxes. You can then restore this backup if necessary. What’s more, if you decide to choose DreamPress (our managed WordPress hosting), you’ll have even more help with backups without lifting a finger! With DreamPress, your site will automatically get backed up daily. You don’t have to set anything up either; it’s included with the service by default. Pretty convenient, right? You won’t have to spend a lot of time worrying about remembering to manually back up your site or what to do if your site is compromised because you’ll always have a way to RickRoll back the clock with an automated backup. When testing or making changes to your site, it’s pretty important to have the most recent version backed up before pushing anything live. We highly recommend adding this step into your web process, if you haven’t already. With DreamPress, the on-demand backup feature gives you full control to make a backup whenever you need to. Automated daily backups are great, but sometimes you need more than that. It’ll give you extra security and confidence to test new things more freely, knowing everything will be OK if something doesn’t turn out as expected. With a single click of a button, a fresh new backup will be available within minutes for you to access — just in case you need it. Learn more about the benefits of backups and hosting with DreamPress. If you do want or need your own backup solution, your best bet is to use a plugin designed for the task. There are plenty of WordPress plugins that enable you to create backups. For some, that’s their only job, while others offer the feature as part of a larger security package. Either way, if you aren’t comfortable with the technical know-how required to back up your site manually (which we’ll address below), plugins are a simple and beginner-friendly option. DreamHost also offers a dedicated tool to help you perform this task. It’s called DreamObjects Backups and is available both for free in the WordPress Plugin Directory and pre-installed on many of our hosted websites. This plugin provides a scalable, flexible backup and storage solution. Using this plugin, you’ll be able to set up a backup schedule, set up how many backups should be saved, and more. When you create a backup, it will be stored in the DreamObjects cloud, our own external storage service. This way, it will be safe in the event that something happens to your site or even to your computer. To get started with DreamObjects Backups, you’ll first need to install the plugin (or simply activate it if it’s already installed on your site). Then, you’ll need to sign up for DreamObjects and create a user. You’ll be presented with a Key and a Secret Key. Copy and paste both into the corresponding fields on your WordPress dashboard. 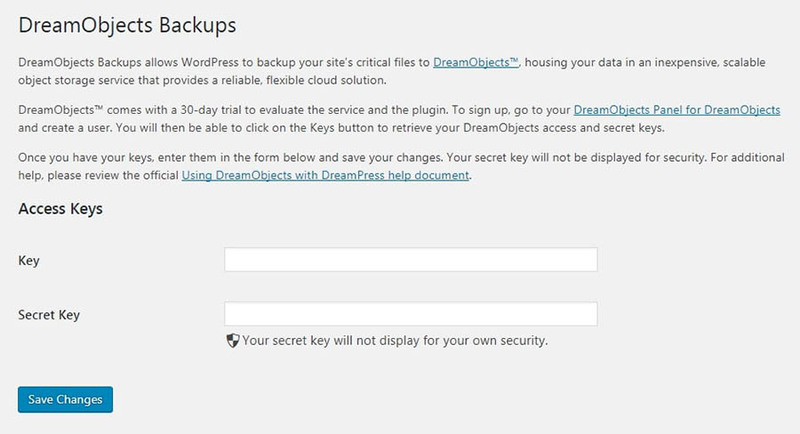 These keys will connect your WordPress site to your DreamObjects account so you can save your backups there. Now, return to your DreamObjects account page. There’s one more task to perform here. Click on the plus sign next to Add Bucket, and create a name for your ‘bucket’. This is simply a location where your backups will be stored. If you want, you can make multiple buckets to keep everything organized, but for now, you’ll just need one. Keep in mind that your bucket needs a unique name not in use by any other DreamObjects user, so you may need to try a few until you find one that works. Next, it’s time to go back to your WordPress dashboard. Navigate to DreamObjects > Backups, and select the bucket you just created from the drop-down menu. Then hit Update Options. Here, you can set up exactly how you’d like your backup system to work. You can choose whether to update your site’s files, database, or both (we recommend backing up everything for now). Then you can choose a backup schedule, and decide how many recent backups to keep. We suggest backing up your site daily, and keeping 15 backups at any one time. Keep in mind that your charge for using DreamObjects depends on how much you’re storing, so be cautious when choosing higher numbers. Finally, you can decide what type of notifications you’d like to see. Selecting All, for example, will let you know both when your backups succeed and if they fail for whatever reason. However, this option will mean you’ll need to log into your DreamObjects account to see notifications and download your backups. If you select to only see Success notifications instead, you’ll be able to do these things right from your dashboard. Once you’ve configured all of these settings, hit Update Options again. You’ll see a couple of new sections. Recent Backup Status is where you’ll find information about what backups have succeeded or failed, and be able to download them (depending on what you chose under Status Notifications). You also now have an Immediate Backup option, so you can create one right away. Selecting the Backup ASAP button will start the process, and won’t interrupt your scheduled backups. That’s it! Once you have a backup, either created by using the schedule or the ASAP button, it will be saved automatically in your DreamObjects bucket. You can download it and save it somewhere else if you’d like, and use it to restore your site if necessary. For now, you have all the tools you need to back up your website — whether through your host or with a plugin. Before we wrap up, however, let’s address a few best practices. DreamObjects is a convenient cloud storage solution, where you can keep your backups safe indefinitely. Simply having recent backups is important, but it isn’t the whole story. We’ve alluded to this already, but how you save and store your backups matters just as much. If you do end up needing to restore your site, chances are you’ll want to be able to do so quickly and easily. This means being smart about how often you back up your site and where you store the resulting files. Let’s discuss the issue of frequency first. As with most questions about your website, there is no one backup schedule that’s perfect for everyone. How often you decide to back up your site will depend on a few factors. The most important consideration is how often the content on your site changes. If you publish frequent updates or blog posts or otherwise change the information on your site a lot, you’ll want to perform backups more often. If you rarely change anything on your site and you have little traffic, you may be able to get away with weekly backups. For most sites, a daily schedule is a better choice. If you publish multiple new posts per day or get a lot of comments and interaction, however, you may want to back up even more often. Ultimately, it’s smarter to err on the side of too many backups, rather than too few. What about location? You could store all your backups on your local computer, but if something happens to it you’ll lose everything. That’s why it’s best to store your backups in an external location — and to keep multiple copies in more than one place. Consider following the backup Rule of Three, which states you should have three copies of each backup, in at least two different formats, at least one of which is stored off-site. This may seem a little paranoid, but again, it’s never bad to be over-prepared. As for where to store your backups specifically, keeping a copy on your local machine allows for quick and easy access. Another copy could go on something portable, such as an external hard drive or a memory stick. Finally, cloud storage is an excellent idea, since you’ll be able to access your backups from anywhere. You can go with a free option such as Google Drive or opt for an option with more features, such as our own DreamObjects service. Once you have a backup schedule in place, be sure to stick with it! If disaster strikes, you’ll be glad you did everything possible to keep your website’s data safe. You can do a lot of things to ensure your site is as safe as possible from hackers, bugs, and accidents. However, you can never completely eliminate the risk of something going wrong. 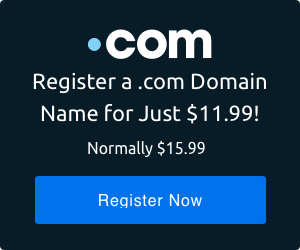 Given this, it’s essential to always have a recent, full backup of your site stored in a safe location, so you can restore your site quickly — just in case a Roland Emmerich-size disaster strikes.